The roller coaster (some people say the simple form coaster) is a kind of amusement park ride. A roller coaster is usually a small train. It has a number of carriages that travel on a track. This track has hills that go up and valleys that go down. Sometimes it has other features that will turn the train upside-down. The track can be made from wood or steel. Some roller coasters are made for children, so they do not travel very fast. Other roller coasters are made very tall and they travel very fast. Riders are generally held in place with a bar, a belt, or something similar. Scientifically, a roller coaster works because of gravity, a force that pulls things down to the ground. Most roller coaster trains are pulled to the top of a hill with a machine. The train will slide down the track, which has a number of hills and valleys. As it slides downhill it goes faster, and it slows down when climbing. In the United States, LaMarcus Adna Thompson patented the first roller coaster on January 20, 1865. He named his ride the "Switchback Railway," and workers pulled the carriage to the top of the track. The first modern steel roller coaster was the Matterhorn Bobsleds at Disneyland. It opened in 1959. Today, there are two main types of roller coaster: Steel roller coaster and wooden roller coaster. 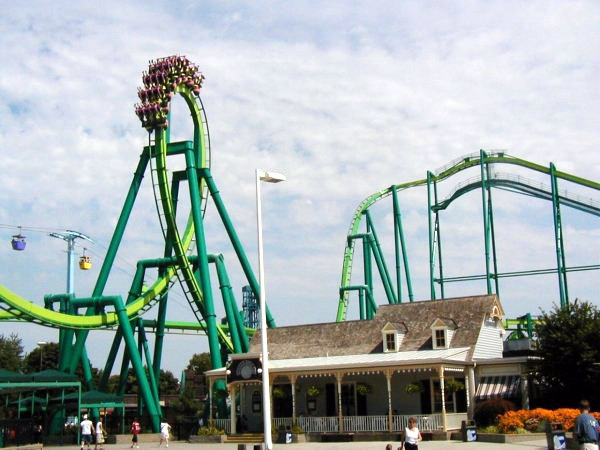 Steel roller coasters can be separated into many more types. In some roller coasters riders stand up or lie down. Some roller coasters sit riders below the rails or beside them instead of above the rails. Some roller coaters spin riders. Until recently only steel roller coasters can turn riders upside down. Now both steel and wooden roller coasters can turn riders upside down. Turning people upside down on a roller coaster is called an inversion. The Smiler has the world record for the most inversions. Kingda Ka Six Flags Great Adventure The tallest roller coaster in the world. Formula Rossa Ferrari World Abu Dhabi The fastest roller coaster in the world. Steel Dragon 2000 Nagashima Spa Land The longest roller coaster in the world. Takabisha Fuji-Q Highland The steepest roller coaster in the world. The Promenades-Aériennes in Paris (1817). 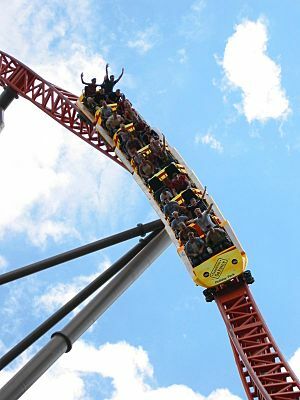 Riding Fahrenheit, located at Hersheypark in Hershey, Pennsylvania. Top Thrill Dragster at Cedar Point is the first strata coaster ever built. Son of Beast in Kings Island was the only wooden coaster to have a vertical loop. The loop was removed in 2006, and the ride was SBNO from 2009 until its demolition in 2012. Roller coaster Facts for Kids. Kiddle Encyclopedia.